Back to School Special: $2 off. Be sure and click the PREVIEW to see lots of pictures and samples of the goodies that are part of this packet. The thumbnails only show 3 of the 7 preview pages. 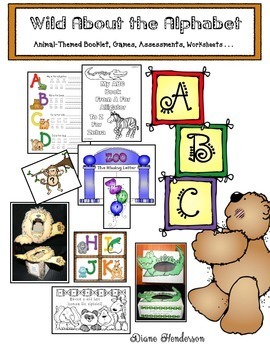 * Emergent Reader “My Animal Alphabet Booklet” (Black & white plus color copies). Students read, write, trace & color. 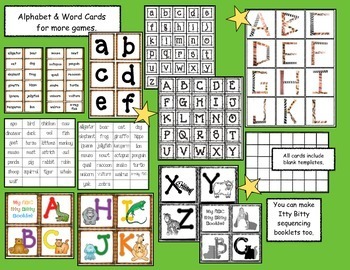 * Use the black and white letter cards to make Itty Bitty booklets. * 5 sets in various sizes for upper and lowercase letters. In color plus black and white,with blank templates to program with whatever. 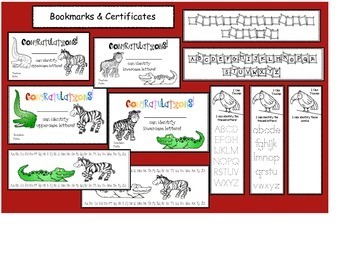 * 26 mini animal word cards, that match the emergent reader booklet, plus 26 more with additional animals. Includes those on the Dolch noun list. 10 Posters Color, plus black & white. 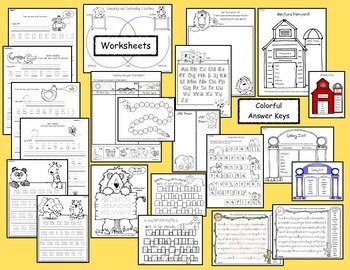 Use the BW ones as worksheets. There are also 26-large, uppercase, animal-print letter posters. Color, plus black & white. Use as a reference, reward or mini assessment tool. 6 Assessments with recording sheets. Assess: uppercase, lowercase, sounds, & letter formation. Easy & quick note home to parents with assessment results. Identifies letter difficulties, and enlists their assistance. Black & white, plus color for upper & lowercase letters. As always, directions, samples and photographs. I’m Diane from Teach With Me, hoping you and your students have a wild & wonderful time with these activities. Click here to see more fun Alphabet activities. For more animal activities click the link. Don’t forget that all my new products are 40% off for 48 hours. Click the green star button to follow my shop & you’ll be notified of these huge savings.